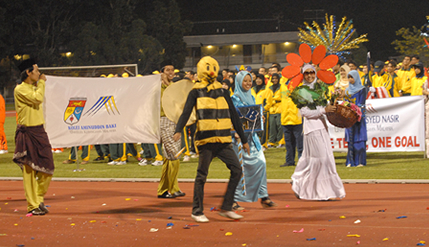 BANGI, 11 Oct. 2010 – Kolej Aminuddin Baki emerged overall champion at the Universiti Kebangsaan Malaysia Sports Meet (SUKEM) 2010 by winning four gold medals – for soccer, softball, mixed chess and woodball and a silver medal for the mens’ basketball. 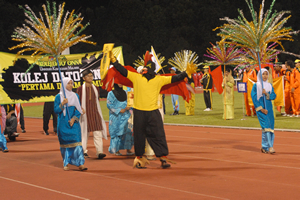 The team received a cash prize of RM1,000. 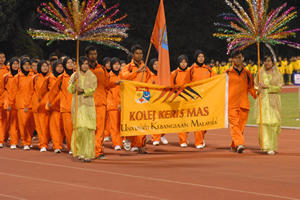 Runner-up was Kolej Rahim Kajai which also won four gold medals and one bronze while Kolej Ungku Omar came in third with three golds, one silver and two bronze medals at the games held at UKM Stadium from 24th September to the 6thOctober. 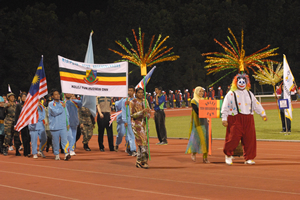 Thirteen team representing all the colleges took part in 16 events with the team representing Kolej Ibrahim Yaakob winning the award for the best parade. Chairman Board of Directors UKM, Tan Sri Dato’ Paduka Dr. Mazlan Ahmad in his closing speech said sports activities can help to bring about closer team spirit while foster a sporting culture of being competitive. 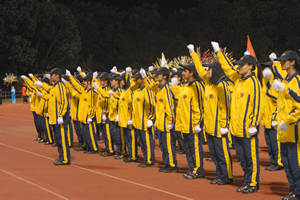 This can be achieved through perserverance, patience, team spirit, constant practice and appreciating what had been won and striving to improvise in order to keep on winning, he said.